What Should You Hit When Exploring The Kansai Region? 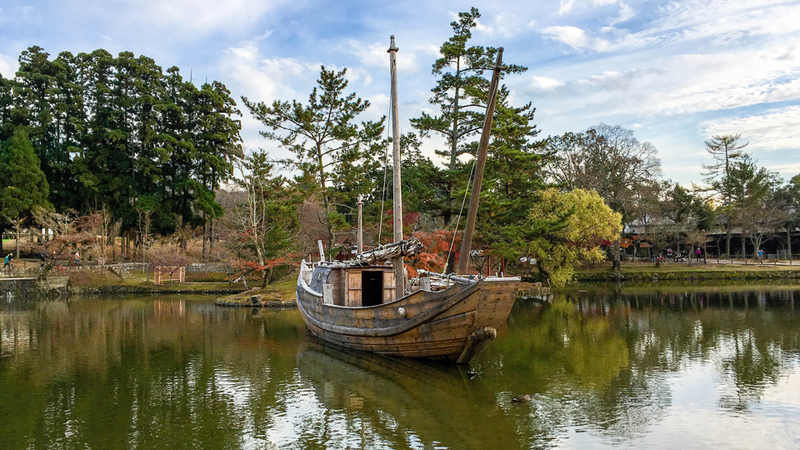 Tokyo is the current capital of Japan, but it hasn’t always been that way. The original start of Japan was actually in the Kansai region. And within this region, the original imperial city of Japan; Kyoto. River flowing through Ohmihachiman, Shiga. If you want to visit Japan and only plan on hitting Tokyo, you’re making a mistake; and almost anyone from the Kansai area will make sure to tell you! The Kanto (around and including Tokyo) and Kansai areas have had a rivalry going longer than you’ve been alive. From what I understand, this rivalry dates back to 1868 when the seat of the Emperor was transferred from Kyoto to Edo, which is now known as Tokyo. 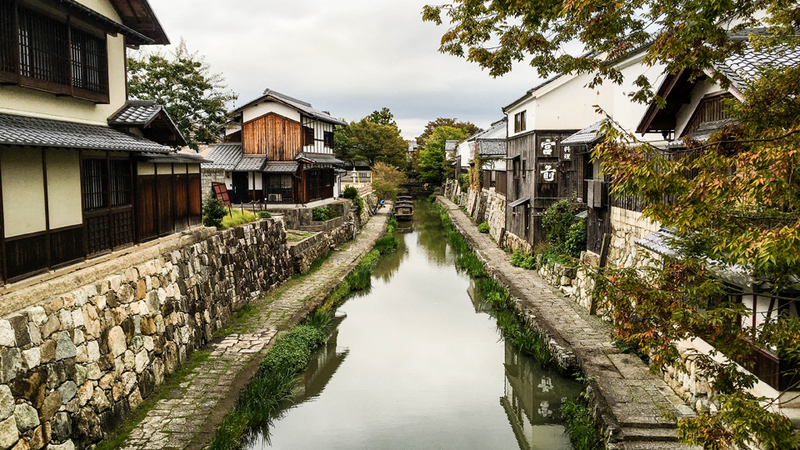 Kyo-no-Miyako was renamed to Kyoto around the 11th century and it was the imperial capital of Japan for over a thousand years! So, it’s no surprise that there is a bit of animosity between these regions. Kansai is comprised of the Hyogo, Kyoto, Mie, Nara, Osaka, Shiga, and Wakayama prefectures. Within these, the biggest cities are Osaka, Kyoto, Kobe, and Nara. Located in the Hyogo prefecture is the city of Kobe, and the other cities are located in their name adjacent prefectures. Want to read about Kyoto, Kobe, and Osaka; you can view my list of Japan for more articles I’ve done. 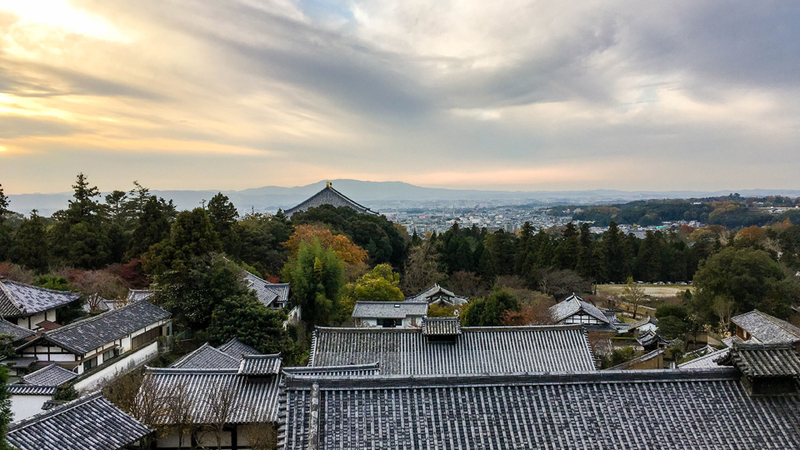 In this article, I plan to cover the areas I visited in Nara and Shiga. I highly recommended that you stay in Osaka city if you plan to explore this region, as it’s a central point in Kansai and enables you easy access to the rest of the region! You should also plan on spending at least a month if you really want to explore more than just the tourist traps! Overlooked in many travel guides I found the city of Kobe to be an all time favorite location! Originally built in the year 607, then destroyed and rebuilt in 711 is another point of interest; the Horyu-ji Temple. Making it the oldest wooden structure on Earth as it just recently celebrated its 1300th birthday! Nara is a popular tourist destination, you’ll see many other foreigners here. For some, this may be a turnoff, but it’s worth visiting regardless due to Nara Park. You’ll find it packed full of deer which often gives Nara Park the nickname of “deer park”. And I don’t mean spotting just a few deer scattered in a field or fenced up like at a zoo. You get to walk with an entire herd of deer! Feed them, pet them, run with them, you can even cross the street with them! However, this doesn’t seem to cause any injuries or accidents. The deer are friendly and rather cautious when at the crosswalk. And yes, I actually witnessed deer crossing AT the crosswalk! I found them scattered around the area, walking down the sidewalk, sniffing food vendors, hanging out in parking lots, but most of them are concentrated in the park. This is despite the fact that while there is some fencing, there are no gates anywhere. Like many other cities in Japan, there are also plenty of temples and shrines to visit. Nigatsu-do Hall gives a great view and is only a short walk from Nara Park. Located right up against the foot of Mount Wakakusa, you can watch the sunset over the city from here on a clear evening. During my visit it was a bit cloudy, but still an amazing view! If you do decide to walk from Nara Park To Nigatsu-do (which I highly recommend) you can also stop by Todaiji Temple on the way, it houses the largest bronze Buddha statue on Earth (if I’m not mistaken)! Shiga, a prefecture located right next to Kyoto (east of Kyoto) houses the largest lake in Japan; Lake Biwa. A small and more traditional city called Ohmihachiman is the area of Shiga I got to explore. From what I experienced, English seemed to be rather rare to come across here, luckily I had met up with a friend who showed me the area! Aside from the old Japanese feel that the area had, the one scene that really stands out is the river. Occasionally you’ll see small boats go down carrying passengers, going between the autumn trees and under the old worn bridges. Ohmihachiman seemed a bit like if Kyoto wasn’t as big, and was lacking the “tourist” draw, which I think is what made me really like this place so much. It felt like the Japan I had always imagined. It was very quiet, both in foot traffic and vehicles, you could easily sit down on a bench and fall asleep. A great escape from any busy areas you’ve been exploring in Japan in my opinion! The photo of the man above used to be a bit of a traveler himself. 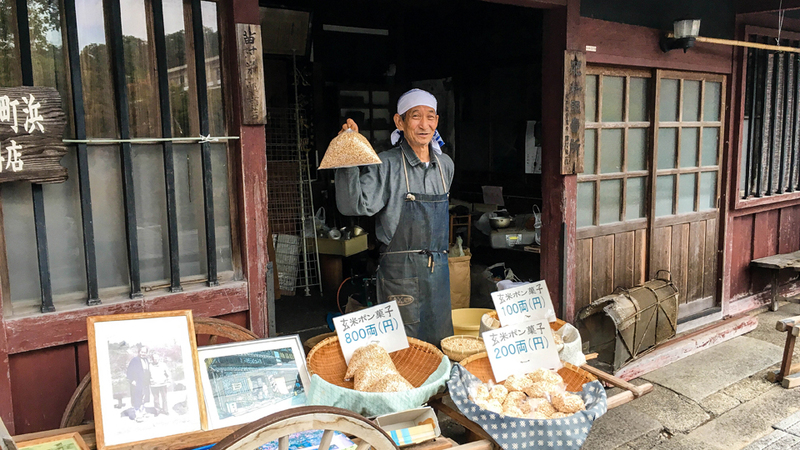 He’s seen plenty of the U.S. and other places and now has slowed down on the traveling and as you can see he now sells a type of snack called Pon-gashi. Much similar to Kashi in the west. People here in Japan are friendly, but they get even more friendly in rural towns like this. Unless your Japanese is good you should visit places like this with a bilingual friend. Otherwise, the language barrier will keep you from fully enjoying it. Another thing that shines in this area of Japan is the food. While Tokyo has it’s variety of world class chefs, most agree the Kansai region has the best to offer in all of Japan. It’s possible that my taste buds haven’t fully developed to Japanese cuisine though as I couldn’t really tell a big difference. Every dish I’ve had in Japan though has been amazing! One I had in Ohmihachiman was particularly memorable. 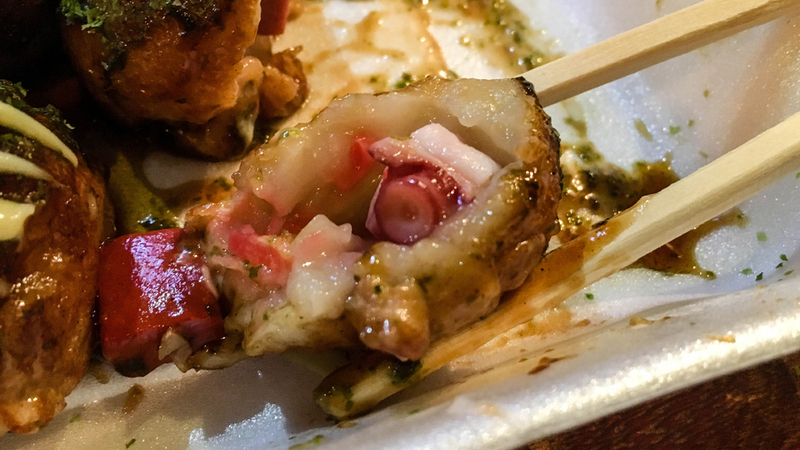 Takoyaki (octopus balls) are pretty popular in the Kansai region and the place I was taken to here had their own special version. Fried and covered with some seasoning and sauces; inside you’ll find pieces of the octopus itself! At first, it’s a little shocking, but they have a unique taste and are excellent if done correctly! I’ve heard of some places that can’t pull them off as well as others. This is certainly something to check out during your visit to Japan! Hopefully, this gives you some ideas of what to check out if you plan you visit this part of Japan. And if you’re coming all this way, there’s no reason why you shouldn’t! Check back soon for more on Japan, followed up by my journey to Korea! Thanks for reading! ← Previous Previous post: Is There More To Kobe, Japan Than Just Beef?